Wayde was born July 16, 1963 in Eureka, CA and died on September 19, 2018. Wayde was a resident of Hoopa, CA, enrolled in the Hoopa Valley Tribe, and was of Hupa, Karuk and Yurok descent. Wayde was raised in Arcata and Hoopa, CA. 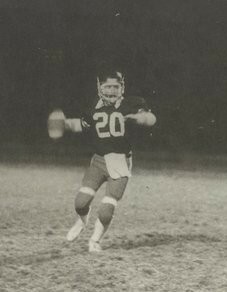 In his younger years Wayde dabbled in several sports, but was most notable for quarterbacking at Arcata High, as well as playing for Humboldt State University. In his formative years Wayde was a traveling man, he was always down for a quick trip to Reno or Las Vegas, or of course for some football in the Bay Area, but his most cherished travels were through Amsterdam, Monaco, France and Spain. Upon his settling down in Hoopa he worked for several construction companies, and spent most years with 6 Rivers Construction of Hoopa. Wayde was preceded in death by his maternal grandparents Edward and Virginia Marshall, Jr., his paternal grandmother Louise (Tripp) Rails, his father Walter H. Morton, Sr., and his nephew Walter Hayes Moon. Wayde is survived by his mother Roxanne Burgess, sister Wendy Morton Moon and her children Kara, Rosella and Charlie, as well as their children; his brother Wally Morton (Jr.), his wife Brandy and their children Tristan, Nanya and Wogs (Walter III); his brother Allen Burgess and his sister Jennifer Burgess and her partner Justin Childs. He is also survived by his aunts Jennifer Singleton, Delma Powell and uncle Chuck Morton. Pallbearers will be Wally Morton, Chip Grant, Roger Sanderson, Kevin Colegrove, Jason Wilder, Charlie Moon, and Brian Singleton. Honorary pallearers are Allen Burgess, Jeff Singleton, Chuck Singleton, Victor Knight, Zane Grant, Sr., Jeff Hodge, Nolan Colegrove, Billy Joe Peters, Merrit Ford, Ross Miller, Odus Powell and Justin Childs. Special thanks to his cousin Toni Colegrove for the care and assistance you have provided in these last weeks. Arrangements are under the care of Paul’s Chapel in Arcata. A graveside service will be held on Monday, September 24, 2018 at 1:00 p.m. at the Hoopa Tribal Cemetery officiated by Pastor Juan Armand. A potluck reception will immediately follow at the Hoopa Fire Department, side dishes appreciated.